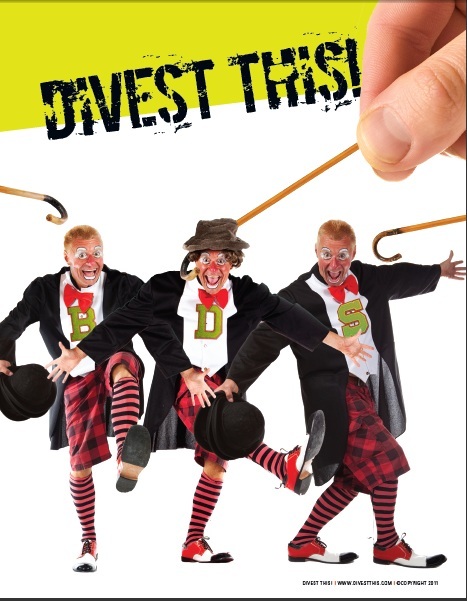 According to Divest This! moles buried deep within every BDS organization in the country, Jewish Voice for Peace (an organization I enjoy taking apart in my other blogger/hobby) has decided to make TIAA CREF their target for divestment over the coming months and years. But didn’t TIAA CREF already divest from Israel last year according to BDS advocates including (if I am not mistaken) the aforementioned Jewish Voice for Peace? So why target the retirement fund again, given that it’s already supposedly following the lead of the boycotters on investment/divestment decisions related to the Middle East? Oh yes, now I remember! The TIAA CREF divestment story from last year turned out to be a fraud! The company made it clear that its decisions regarding buying and selling shares in Israeli companies (or companies doing business with Israel) had nothing to do with politics including (or should I say, especially) the politics of those hectoring them to join the BDS bandwagon. So now it seems that JVP is trying to win a genuine victory with CREF, rather than take the easier (but ultimately more ridiculous) route of trying to perpetrate another divestment hoax. Unfortunately, once you send out press releases making false claims about the actions of a third party (such as TIAA-CREF), that third party is not very likely to want to take your phone calls the following year. Which is why CREF has responded to their new campaign with a polite but firm “We are not divesting from holdings in Israel” followed by “We appreciate you taking the time to share your thoughts” which to me reads like “don’t call us, we won’t call you”. Now no one knows what the future may hold with regard to CREF or any other investor in Israel. But as we wait to see what happens, I think it’s more than fair to demand that, given its history, JVP and other divestment supporters can only claim victory when they stand alongside the leaders of the group that is supposedly doing the divesting at a joint press conference where CREF states clearly and unequivocally that the organization is divesting for the political reasons claimed for them by the BDSers. Fair enough? Until then, I’m happy to take the boycotters at their word that a dollar spent or pulled from the stocks they list represents support or political criticism of the Jewish state. Which means that, at least for now, CREF supports the state of Israel to the tune of $300,000,000. Given the current economic climate, notwithstanding the chronic state of (undeclared) war on Israel, it remains one of the best economies in which to invest. The BDSers not only lack any sense of proportion when it comes to regional politics and facts on the ground, they also understand squat about investing money. JVP's TIAA-CREF campaign has already made history by gathering the broadest range of US campus-based divestment endorsers ever – we've barely begun, and we already have the support not just of rabbis but of academics from literally dozens of colleges including the University of Central Florida, Harvard, Princeton, University of Louisville, UCLA, MIT, Brandeis, University of Chicago, University of North Texas, University of North Carolina and the University of Pennsylvania. Dozens!!! Count'em. Dozens!!!! They are on a roll, those ever so optistic bright eyed bushy tailed folk at JVP. Dozens. Literally. Mom and Dad must be so proud. I was also at the meeting, surrounded by Adalah NY and Code pink activists. Yuck. Rebecca of JVP stated that this campaign had two goals. One goal, of course was divestment “policy change”, but the second goal was “movement building” and “public education”. There's your fantasy politics, again….. Putting aside that “dozens” of American campuses (of which there are approximately 4100 in total) means that JVP has yet to crack the half a percent mark in terms of quantity, they are not claiming that these campuses are actually following their lead and asking TIAA-CREF to divest. Rather, they are claiming that on “dozens” of US campuses, they have found enough people (including, believe it or not, academics) willing to sign this year's anti-Israel petition. JVP members are free to let us know why their announcement represents anything more than getting the same people who've signed everything else JVP has ever put under their noses to sign their CREF petition as well. Until then, Israel still seems to still be up $300,000,000 to zero in JVP's chosen battlefield. When is a failure a victory? Click on the link, and you learn the response is… No. Thats right. No. As in “No way”. Cecile, explain to me why exactly this is “good news” to you? In case anyone wants to write in with an equal and opposite response…. Another laugh out loud moment in the world of BDS. Did you happen to get the list of BDS “success stories” courrently being spammed by the usual suspect? CODEPINK also confirmed with Costco that it would no longer carry Ahava products after a letter-writing and calling campaign by activists across the U.S. (Uh, not quite, they simply sold out of their Christmas Ahava promtion in January. Costco continued to carry products from Israel, including Aviva matzah. Which is not currently in stock, not because of any political decison, but because the market for matzah significantly decreases at the end of Passover) And the Israeli clementines at Costco? Code Pink- whats your explanation for that? And then again, the non-devestment from Hampshire College is also listed as a success….